A sandwich with coleslaw and fries -- that's nothing new. But what about a sandwich with coleslaw and fries right inside? That's what you'll find at Primanti Bros., an iconic Pittsburgh sandwich shop with locations all around the Steel City and beyond. 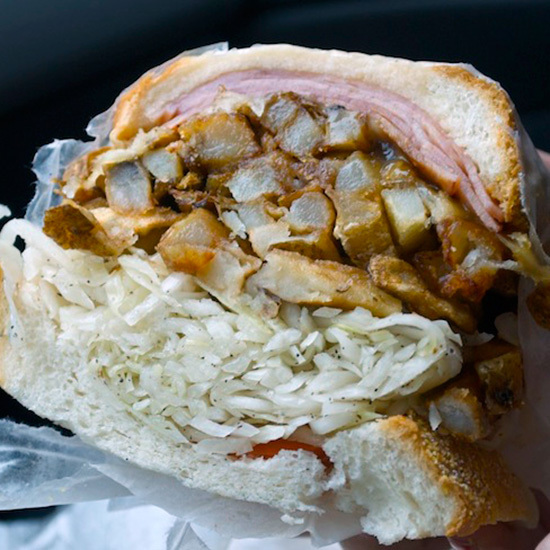 Primanti's got its start in the 1930s, when Joe Primanti opened up a sandwich cart in the Strip District, feeding local dockhands and workers with his substantial hand-held meals. That cart evolved into a restaurant — one that soon became widely known for its fry-stuffed sandwiches. "Save for pierogies, I can't think of a food that is more 'Pittsburgh' than a Primanti's sandwich," says Pittsburgh-based food journalist Gretchen McKay. "People love them, and not just locals who grew up on them or family returning home for the holidays. I think they're iconic because they're so ridiculous -- meat piled high with house-made coleslaw, fresh-cut fries, tomato and cheese between two thick slices of Italian bread. It's a two-hander." The filling. The Primanti's menu is extensive: sandwich options range from kielbasa and cheese to knockwurst to “The Pitts-burger." But what they all have in common is the pile of fries, slaw, and tomato that stack this sandwich to an imposing height. The best order? "You can't go wrong with the capicola and egg sandwich," says McKay. The bread. Soft but thick-cut Italian bread is the base that manages to contain this monster of a sandwich. There are many other official Primanti Bros. locations around the area as well; and then, the Primanti's imitators. As McKay says, "Honestly, why not just go for the original if you want fries on your sandwich?"